Hello crafty friends! It’s Zinia here and today I want to share with you a really fun technique to create a custom pattern for your projects. Although I’m using this on a scrapbook layout, you can adjust the size and use it in cards minibooks or any other type of craft. I used some hexagon dies to cut my paper but if you don’t have dies you can use a punch, your electronic die-cutting machine or just fussy cut the shape. 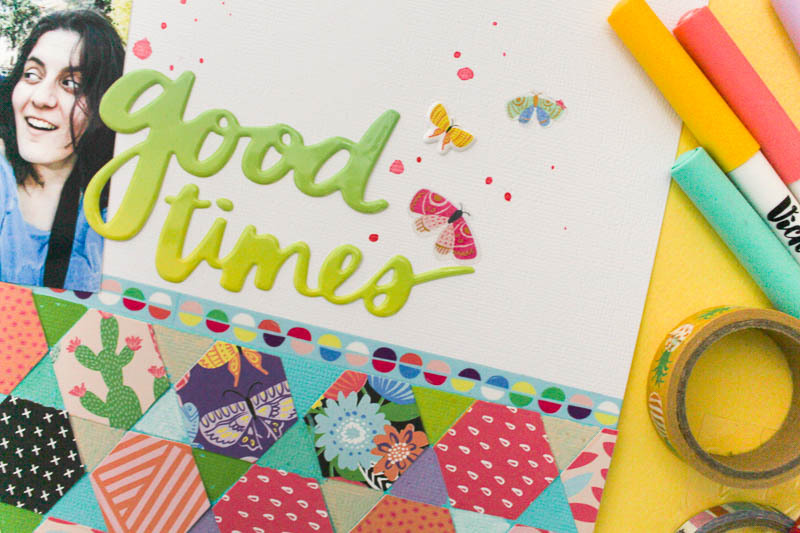 I used some of my favorite patterns from Amy’s latest collection Sunshine and Good Times and I made sure to grab a nice variety of patterns and colors. I decided to build my pattern on top of some colored cardstock. I pulled a beautiful sheet of turquoise and used it to cover approximately half of my background. I also used a strip of washi tape as a border to separate the white background from the turquoise pattern base. The next step is really fun and easy! Just grabbing the hexagons randomly and sticking them down to build a pattern. Instead of aligning their flat sides, I connected my neighboring hexagons at the corners. This way I created some small triangle gaps in between to let the turquoise pop. If you skip one hexagon in this arrangement, you will create a star shape, so I used that to my advantage and intentionally created some stars. 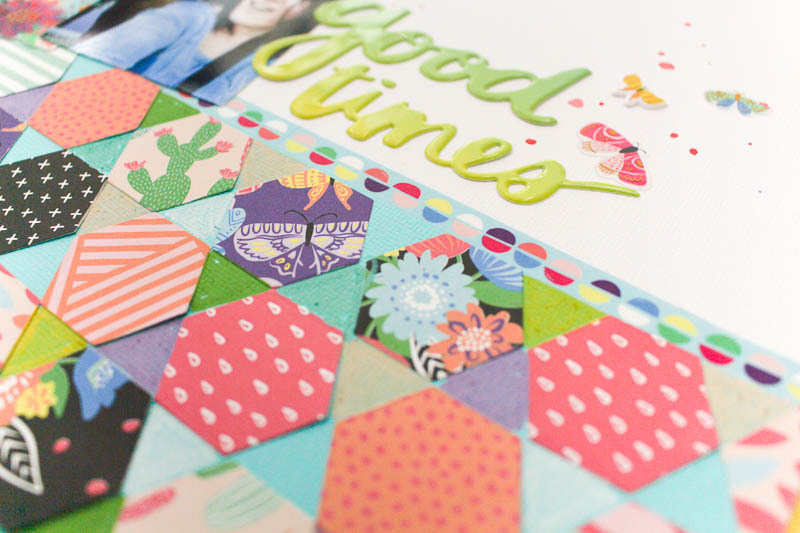 The create the perfect little spot for extra embellishments or just to add your journaling. Once all the hexagons were stuck down, I decided that the whole piece had too much turquoise and it didn’t really look balanced. To fix that, I pulled my favorite American Crafts paint markers and I colored in some of the gaps with different colors. When the balance was restored and I was happy with my pattern piece, I moved to the top of the page and I started working on my photo and title. I tried to keep things relatively simple cause I didn’t want to steal the spotlight from my fancy hexagon pattern. I used a few ephemera pieces to frame my photo and a few butterfly stickers flying away from my title. Then as a final touch I added a couple of pink splatters around. I really hope you will give this technique a go and you will create some fun hexagon patterns with your favorite papers. Until next time, happy crafting.